I’m thinking next year, I’m going to host a big brunch, with mimosas of course, so that all my fellow SAHM’s and myself can raise a glass and a toast to the fact that we all managed to retain our sanity throughout another entire summer, and of course that all children are still happy and healthy. While I love my boys, I’m always happy to see that first day of Summer Vacation, and I’m just as happy to see it go. Does it take anyone else an entire school year to recover? No, I didn’t lose a son. Son # 1 was struggling to get out the door this morning and missed the group photo ops. It seems somebody was a little to used to secretly reading half the night, and didn’t realize how early 7am would come. The days of sleeping in until noon are over. At least until next Summer, or the weekend. Here are the bright eyed and bushy-tailed ones, ready to go. I found these free, printable grade signs, which I LOVE from Designs by Nicolina. Now, let me introduce you to my latest idea. The Homework Caddy. In an effort to cut down on wasted time, misplaced assignments and supplies, and mismanaged time all 3 big boys will be doing homework at our very large, and accommodating kitchen table this year. The homework caddy will be on-hand each day, smack dab in the middle of the table with all the supplies each boy could possibly need to complete their assignments. Best of all? There will be no reason, or excuse, for any of our homework supplies to be ‘walking off’ this year. Here’s to hoping this also prevents the over-used, ‘But Moooooom, I can’t do my homework because I don’t have…’. Inside the caddy, which I found at Jo-Ann’s craft store, are 3 pint-sized Mason jars containing markers, sharpened pencils, and colored pencils. There’s plenty of loose-leaf tucked in the back, and even a pad of construction paper. Pens have been included and tucked away in the bottom is a pair of scissors, manual pencil sharpener, and two glue sticks. Did I manage to forget anything? 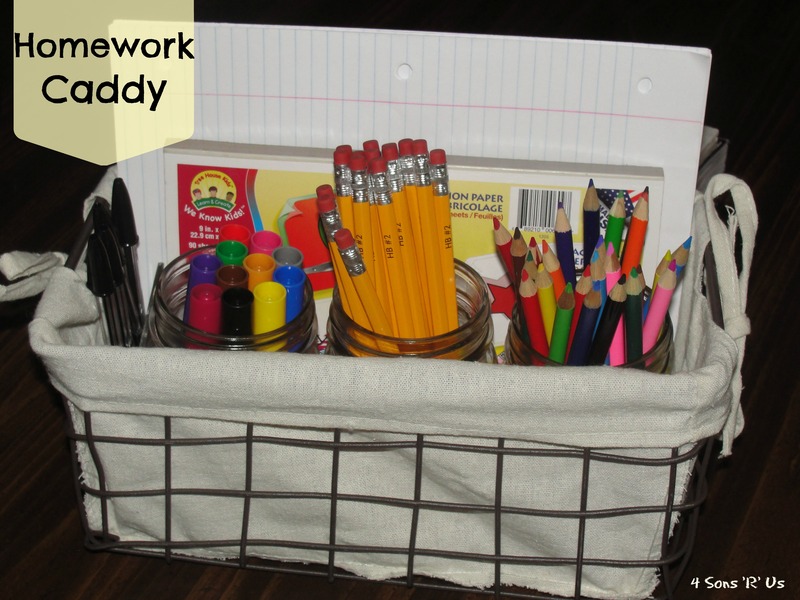 Make homework time just a little bit easier this year by making your own homework caddy today. Oh, and fellow parents? We made it! 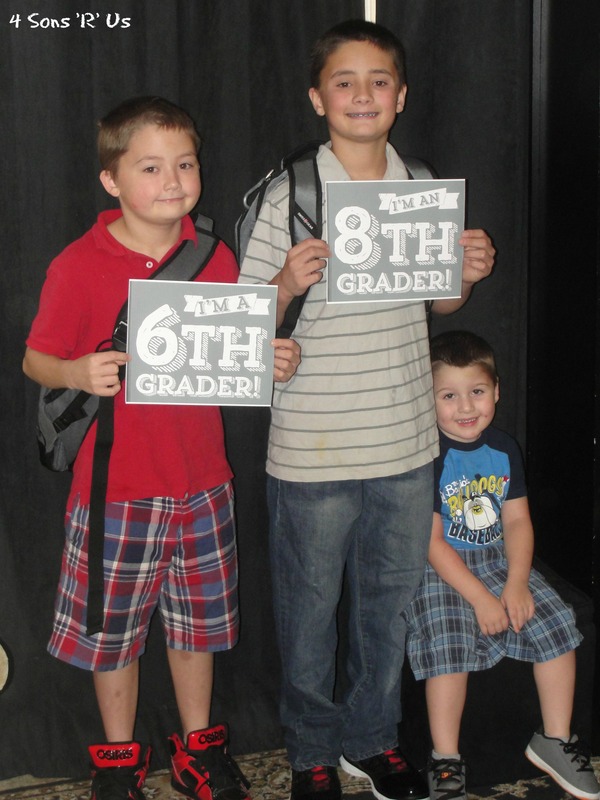 Happy 1st Day of School 2013. They say great minds (& Moms) think alike! I’m always looking for new ways to get them more organized and help things run as smoothly as possible.